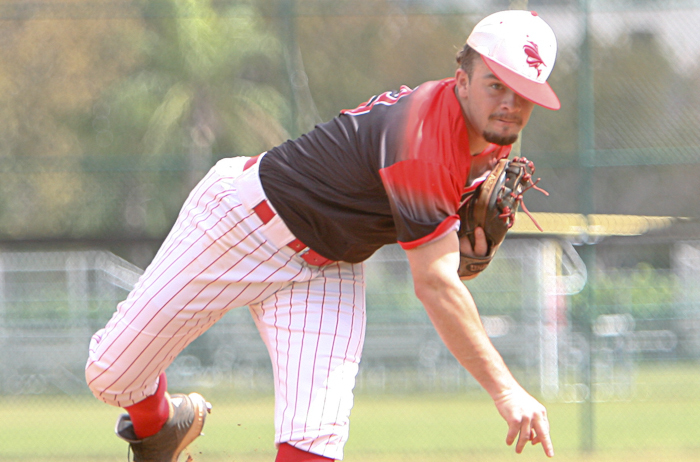 Coral Gables starting pitcher Ernest Denis went 6 1/3 innings on Tuesday to pick up the win. 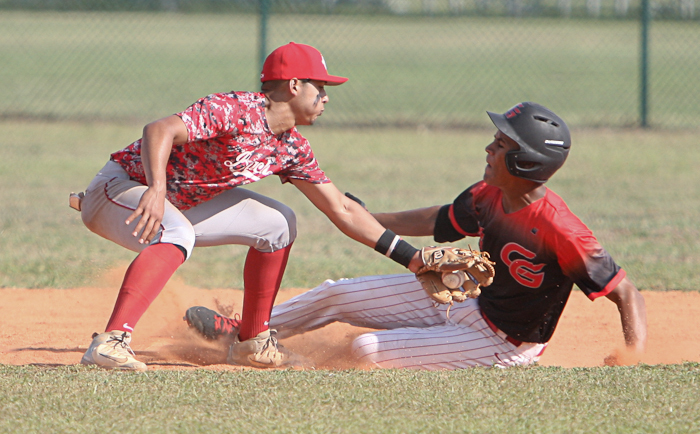 Coral Gables took advantage of its opportunities to score six times in the first inning and then held off visiting Miami Beach for a 7-3 win Tuesday afternoon in a 9A-14 game at Woodward Field. Cavaliers starting pitcher Ernest Denis gutted out 6 1/3 innings, striking out seven while pitching around four errors. He gave up five hits and walked five. Adrian Rojas closed it out for the Cavaliers, recording the final two outs of the game. The Cavaliers took advantage of six walks and an error in the first inning to plate the first four runs of the game. Then catcher Gerardo Rodriguez made his second plate appearance of the inning a meaningful one with a two-run double. The key hit was also the only one of the inning for the Cavaliers and increased their lead to 6-0. 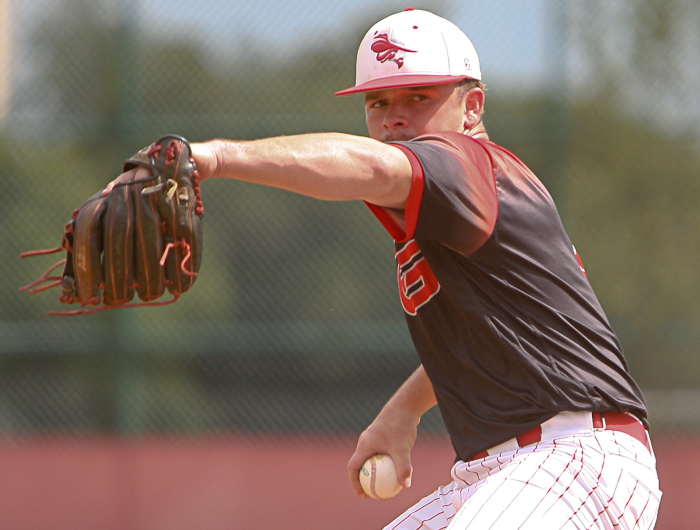 It was a close play at second in Coral Gables’ 7-3 win over Miami Beach at home on Tuesday. Miami Beach relief pitching held the Cavaliers in check the rest of the way. Hi-Tides reliever Samuel Winetraub threw two scoreless innings, striking out four. But by then the damage was done. “We made some key errors, weren’t hitting, didn’t make the plays when we had to,” Winetraub said. “I started off a bit shaky, but the next inning went smooth. But as a team we just didn’t come together today. “We just need to focus on getting the routine plays down and just keep up momentum throughout the game,” added Wintraub, whose Hi-Tides lost for the first time in four district games and slipped to 5-8 overall. It was the fifth loss in six games for Miami Beach, now 0-5 on the road this season. A high throw sails into center field during Coral Gables’ 7-3 win over Miami Beach on Tuesday. “Beach is a great ballclub,” said Padron, whose Cavaliers improved to 3-2 in district play and 7-5 overall. “No lead is going to be safe with them because they are an experienced club. They had good at-bats the entire day. Against experienced clubs, you cannot let them get back in the ballgame. I have all the respect for what they’ve done and what they’re doing. Denis played a lot of baseball on Tuesday, coming within two outs of throwing a complete game. 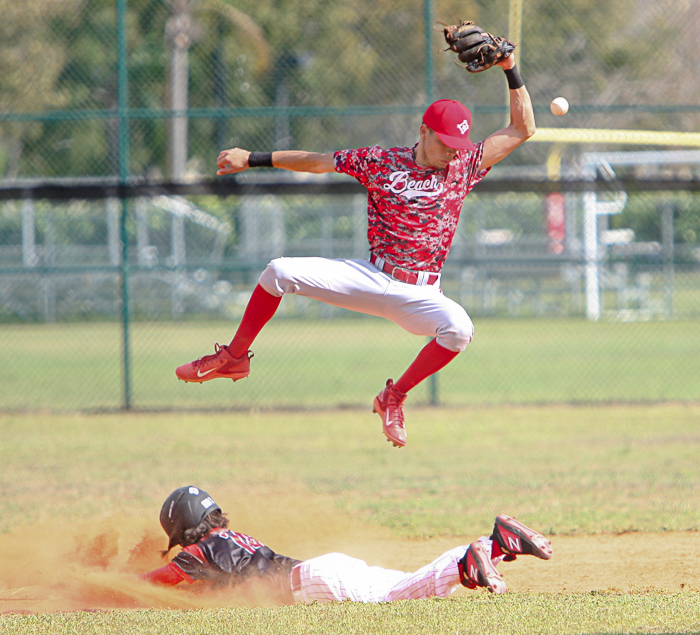 Miami Beach attempts a pick-off move at second base on Tuesday in Coral Gables’ 7-3 win. Denis pitched his way through a rocky third inning when Miami Beach scratched across two runs on three singles from Luis Gonzalez, Oliver Rojas, and Jonathan Vasallo, and a walk. Denis gave up just two hits after that, a single to Angel Vizcaino and a double to Manuel Senibal, coming out more focused than ever over the final innings. Denis follows through on one of the many pitches he delivered on Tuesday in the Cavaliers’ 7-3 win over Miami Beach. “Anytime I show up to pitch I basically just pitch for my team,” Denis said. “I basically pitch for outs. I don’t look for the strikeout, I give my defense an opportunity to make plays. And that’s the best part about having confidence on defense. That’s what I love about this team, they back me up when I need it. The Cavaliers managed just five hits. 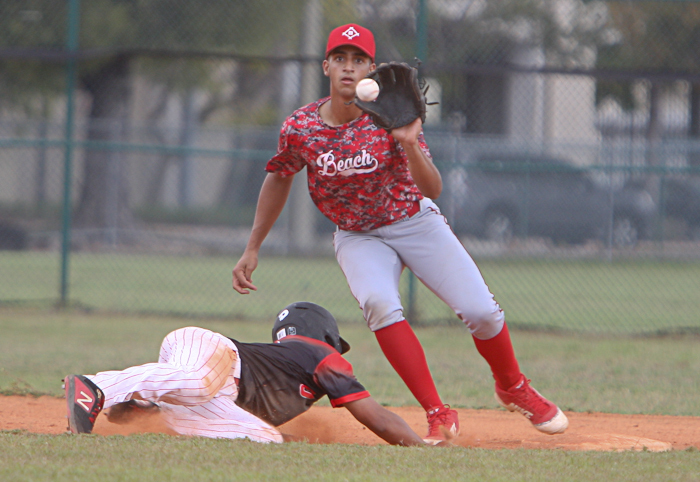 Aside from Rodriguez’s clutch double, Coral Gables got two hits from Manny Jackson, and a RBI single from Erick Denis.